1. Follow desire. Believe that God wants you to pray long and that He will give you a continuing desire for as long as He wants you to pray. Yes, if He is leading you, and you have set your heart to pray for one, or two, or three hours, He will be faithful to show you His heart and supply you with all the desire you need to continue for as long as you have planned to pray. Indeed, those faithful ones who prayed all night long were blessed with continuing desire until the morning hours. But, you say, how do I know if my desire is of God or of the flesh? Let me say this: when you begin to pray, don’t start with a list of all your wants. Begin instead by meditating on a passage of scripture. Then, as you reflect on the passage, ask yourself questions such as these: (1) Is God showing me a sin in my life? (2) Is there a truth He is showing me? (3) Is there a command He wands me to obey? (4) Is there an issue in my life He wants me to deal with? As you continue to meditate and listen to God, praise Him and thank Him for how He has spoken to you; sing to Him and worship Him with all of your heart, focusing all your energy and attention on Him. While you are engaging in praise and worship don’t think that you will at some point stop praising Him and go back to your list of wants. Forget about your list! Focus only on Him and He will give you His list! Yes. He has a list of all the things He wants you to do and of the things and blessings He wants you to have. Continue to praise Him and be confident that He will continue to enrich your prayer time with desire flowing from His heart. Praise will then flow into more praise until your focus of God becomes clearer and clearer. Be silent then before Him as He pours out His heart to you. Pray over each need as He gives it. Some things may come with such strong desire that you will not be able to hold back the flood of tears. And oh, what great peace and joy often follows! If you are still in doubt whether desires you have are of God or not, just continue to pray over it, asking Him to show you whether it is of Him. If the desire is of Him it will get stronger as you pray over it and consider it in the light of scripture. However, if the desire is of the flesh, as you pray over it, it will soon die like a burning ember being doused with water. 2. Start with quantity. If you are planning to pray long don’t worry about how you will be able to do it or about using all the right words; just plan to pray long, and get to it. If you want to pray for one hour, set your mind with the goal of praying for one hour. Then, just begin to pray, being careful to follow the Holy Spirit’s leading—consider also that the Holy Spirit may want you to plan your prayer time, so as to pray according to an outline. There is more on this in point three. Believe that the Holy Spirit will lead you and help you to pray. For we have the promise in Romans 8:26, that the Spirit helps our weakness; for we do not know how to pray as we should, but the Spirit Himself intercedes for us with groanings too deep for words. If you follow His leading, in time your prayers will not only be of quantity, but of great quality; that is, He will give you all the right words to pray—words of great sincerity, truth, and grace, words that flow from the heart of God. Therefore, don’t make the big mistake of trying to be careful with your words, and even writing out and rehearsing your prayers. Forget about all that. Just pray from your heart. Tell God how you feel. If you don’t have the words then be silent before Him. If you feel that God wants you to tell Him how great He is, just say, “God you are so great,” and say it over and over until another thought comes. Don’t worry about what it sounds like. God knows your heart. If your heart is sincere He will cherish every heart-felt word. Yes, he will receive your prayers as beautiful poetry. 3. Structure your time. Though I have stressed that we should follow desire, we must also have some sort of structure. I would suggest beginning with scripture reading and meditation, then a time of praise and worship, and then wait on Him, as He will show you what to pray for. Sometimes during your worship time you may want to read the Lords Prayer as a reminder of all the essential ingredients of prayer. You may even want to structure your entire prayer time around the Lords Prayer—praying for fifteen minutes or so on each of the six points of the prayer. However, you may find that that method of prayer is too ridged and won’t allow the Holy Spirit to fill you with His desires. Try to find a balance of how much structure you need to keep focused and still follow the Spirits leading. I said earlier that you should forget about your list, that God would give you His list as you are praying. I want to say now, that even before you begin praying God may lead you to write out a list of prayer requests. Lists are okay as long as God gives it. I have often been led of the Holy Spirit to write down all of my concerns and wants and then to bring them all to God. For scripture tells us that we are not to be concerned about anything, but that we should instead pray about everything; and then God has promised that He will give us a peace that passes all understanding (Phil. 4:6,7). God may also lead you to make a list of people to pray for. He may even lead you to pray for all the people in your Church. If your church is large it may take awhile, but if you are faithful to pray for each one God will give you a great blessing. Whether you start with a list, or whether you go empty handed, trusting Him to show you each item on His heart, they are both equally good methods of prayer if God has indeed given them. 4. Be prepared to struggle. Know that prayer is no easy task. Be prepared to work and sweat, to wrestle with God, and to stand fast against the devil. Prayer is hard work, but if worked through it will reap a blessed harvest. 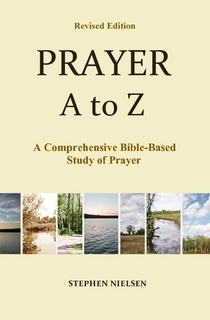 This entry was posted in Length of Prayer, Prayer A to Z Excerpts and tagged desire in prayer, Fasting, prayer. Bookmark the permalink. I think that would be real beneficial to do that. Just plan the time and do it! How did it go? What was your experience during that prayer time? I have also found praying through a passage of scripture to be helpful to add structure. Choose a psalm and let those words be your prayer and let separate prayers span out from each idea or each clause or verse. Praying through the Psalms of Ascent is a good place to start or Isaiah 40-66. I appreciate your heart, brother. Thanks. I’m not sure what you mean by the Psalms of Ascent. And can you tell me what you like about Isaiah 40-66–why you choose these chapters. The Psalms of Ascent consist of Psalms 120-134 and were used as “travel songs” that would be sung by pilgrims on their way up to Jerusalem for the festivals. Thus their design is meant to focus one’s heart on the coming time of worship — funny how little we prepare ourselves for worship in our modern age, but they took preparation seriously as did many of our Christian forebears. thank you,I never had exceeded 10 minutes but today im going beyond 30! I have prayed 10 hours! glory to God! The experience is supernatural, extraordinary, u can only win. its amazing I should say…. Great! I’m glad to know that you are getting to know Him. Thank you for your website. Sometimes I can pray for an hour but I really want to go beyond that as well as learn faithfulness in daily prayer. God bless you Irene for following the Lord and being willing to pray long. We often get stuck in a rut of praying for a certain time every day and think it’s okay. But sometimes God may want us to break out of our usual routine and pray longer. Please pray for me I want to pray for more than 1 hour. I have a serious problem with prayer, I can’t even pray for 10mins. I think my case is a very pathetic one. I need your prayers. I will pray for you. But there are things you can do. I would focus more on a bible verse and pray that verse into you life. also, write all your prayer need down to help you focus. and don’t worry so much about your words when you pray. God knows your needs and your concerns. I pray in my own tongue–English. The Holy Spirit will help us pray just as he wants us to pray–according to His will. God bless you.